I have been asked for help by my late friends widow Margaret Wilmshurst for help in identifying the sign in the picture, its very nature suggests a railway connection, but I can’t identify the company from the initials. The initials immediately bring to mind the Newry, Warrenpoint & Rostrevor Railway, in County Down, which in the late 1870s became part of the Great Northern Railway (Ireland). Despite the title, the company only ran between the first two mentioned places; the extension to Rostrevor was never built. However, a separate company, the Warrenpoint & Rostrevor Tramway, ran between these places from the 1870s and 1915, when it closed. The line from Newry to Warrenpoint, a very popular resort, saw many excursion trains until its demise in the 1960s. Both the railway and tramway had very scenic routes along the northern shore of Carlingford Lough. I am sorry to say that although this is nicely made with period style letters etc, discussion elsewhere on-line believes it is entirely fictitious. Maybe somebody Richard R made them for himself and his girlfriend Norma W? Certainly this has nothing to do with LNWR. 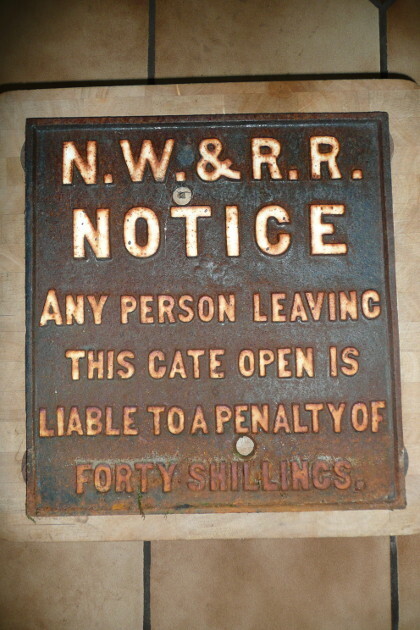 The definitive guidance on cast iron Gate Notices is by the estimable Tim Petchey of the Winchcome Railway Museum (Railway Antiques Handboook No 5). No ‘N.W. & R.R’ pattern sign is listed there. There are a large number of recently-made signs such as this in circulation, with various initals in the heading, based on the pattern of the authentic Inchicore Works casting for the G.S. & W.R. gate notice. Irish Railwayana specialist Ken Lennan lists this N.W. & R.R sign as fake, see his website.